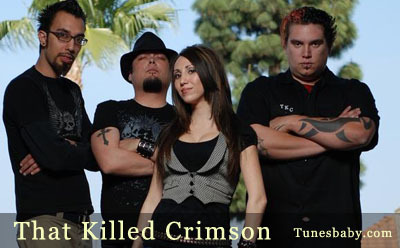 That Killed Crimson was started by lead singer/guitarist Nicole Macias, after her solo project, Crimson Heart was demolished and led to non-existence with some personal complications, thus leading to the band name, “That Killed Crimson”. Nicole returned to her home in Covina, CA after being gone for so long. Everyone thought she was never going to come back or continue pursuing her lifelong dream to have a successful career in making music. Nicole came back with a mission. A mission to find the perfect band that fit into her musical pocket to share her music to the masses. After searching high and low, and hiring and firing many musicians, Nicole came to conclusion that her band would consist of Kris on the drums, Ed on guitar, and Kurt on bass and backup vocals, and Nicole would still play guitar and sing the lead vocals. Kris and Nicole had went to high school together and lost touch, until Nicole’s father spotted him at Guitar Center in Covina, where Kris was working in the Drum Department. Kris and Nicole had been in a band together throughout high school and when Nicole tried him out, they still had the musical chemistry and knew each other’s style in music. Kris then introduced Nicole to a shredding guitarist named Ed, now nicknamed Shred for his guitar shredding abilities. Kris and Ed had been in a band together for a while after high school, and knew each other musically, so when Nicole tried out Ed, all the music fit together and connected like pieces of a puzzle. They just needed to find the last missing piece of the puzzle: the bassist. After hiring and firing a handful of bassists, Ed introduced the band to a co-worker of his that he had been talking to who was a singer/bass player. When the band heard him play, they knew that he was the missing piece of the puzzle. Not only could he play the bass extremely well, but he also could sing back-up vocals for Nicole. That Killed Crimson is now rocking and sharing their music with anyone who wants to listen. For now, you can see That Killed Crimson rocking your local music venues. You can check out their upcoming shows, buy music, look at pictures and videos, listen to music, get more info and book them on HTTP://www.Myspace.com/ThatKilledCrimson A few venues to name that they have played have been: The Troubadour, The Viper Room, The Key Club, The Slidebar, BB Kings, Saddle Ranch, Hollywood Park and Casino, Irvine Lake and more. Some national bands that they have played with include: Finch, Unwritten Law, Kottonmouth Kings, Hed PE, Story of the Year, Escape the Fate, I am Ghost, I:Alive, A Static Lullaby, Bullets and Octane, and more. That Killed Crimson has a unique mixture of sound unlike any other. They are a mixture of Rock/Metal/Alternative/Punk/Pop ext. To experience this Catchy and Tuney, yet Tasty and Different new sound, That Killed Crimson would love to see you at their shows and love to know that you have their music in your mp3 or cd player! We only play in California in the U.S.A. currently, due to our budget, but hopefully soon, with your help, we can travel and play around the world!